Australian rock music has long been recognised on the world stage and has played a huge part in shaping a rich and diverse national music culture. It should be noted, however, that there is much more to Australian rock that mega-bands like ACDC, INXS and Cold Chisel, with a large number of successful alternative and punk rock bands emerging on the scene in the late 80s to mid-90s. 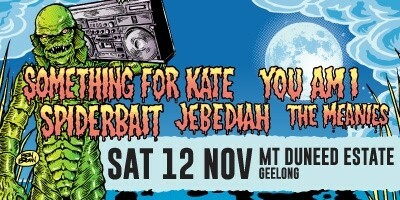 Bands from this period, such as Something For Kate and You Am I, quickly gained their own cult following and went on to make a significant impact within the Australian music scene. In this blog we explore the beginnings of these, and other, great Australian bands and find out where they are today. Alternative rock band Something For Kate first formed in 1994, with Paul Dempsey on lead vocals and guitar and Clint Hyndman on drums. The pair, who went to school together in Mornington Penninsula, struck up a friendship and decided to form a band, moving to Melbourne to try their luck in the local music scene. They soon found Julian Carroll, who joined the band as their bassist before quitting in 1998 to settle down with his family. Carroll was replaced by Toby Ralph, who was subsequently replaced by Stephanie Ashworth after just two years. Ashworth and Dempsey went on to marry in 2005. Something For Kate have enjoyed huge national and international success, being nominated for 16 ARIAS, achieving 5 platinum and gold selling albums and receiving numerous awards over their 20 plus year career. They have toured with a huge range of musical acts including Pavement, Swervedriver, Powderfinger, You Am I, Death Cab For Cutie, and even David Bowie. Fun fact: The band originally called themselves “Fish Of The Day”, however they were urged by music venue booker Richard Moffat to come up with a better name, and so Something For Kate was born. The “Kate” in the band’s moniker is actually a reference to Dempsey’s childhood dog, a Jack Russell called Kate. You Am I are another incredibly influential homegrown alternative rock band, who formed in Sydney in December, 1989. Fronted by lead singer and guitarist, Tim Rogers, You Am I have enjoyed immense success over their 25 plus year career, being the first Australian band to release three consecutive albums that each debuted at number-one on the ARIA charts. They have received 10 ARIA awards out of 31 nominations and have toured with the likes of The Who, The Rolling Stones, Sonic Youth and Oasis. You Am I have featured in the Triple J Hottest 100 a total of 16 times (in both the annual countdowns and 2011’s Hottest 100 best Australian Albums of All Time) and have released 10 albums and many more EPs throughout their career. Fun fact: After dropping out of law school in his early 20s, front man Tim Rogers had resigned to a life of delivering pizzas, however this all changed when his brother and best friend asked him to join a band. Rogers is also a self-confessed clean freak, earlier this year presenting a talk at Melbourne’s Wheeler Centre where he spoke about his compulsion to scrub, mop and dust. Both Something For Kate and You Am I have made significant contributions to the Australian music scene and are still pulling large crowds today, more than 20 years since their inception. In next week’s blog we talk you through the colourful careers of three other great Australian bands: Spiderbait, Jebediah and The Meanies. You can catch all of these Australian music icons at A Day On The Green, November 2016. Melbourne On The Move are providing transfers to both the Mt Duneed Estate, Geelong, and Rochford Wines, Yarra Valley, shows on the 12th and 13th of November, so rather than worrying about transport you can sit back and enjoy the music.